Mississauga, ON – On Monday, June 18, 2012, Lata Pada Artistic Director for Sampradaya Dance Creations, was honoured with the Queen Elizabeth II Diamond Jubilee Medal for her outstanding contributions to the community as a Canadian citizen, at the Diamond Jubilee Gala at Roy Thomson Hall in Toronto. The Queen Elizabeth II Diamond Jubilee Medal was created to mark the 60th anniversary celebration of Queen Elizabeth’s coronation. Inspired by the Queen’s service to the Commonwealth nations, this commemorative medal will be awarded to 60,000 Canadians throughout the course of the year to exceptional Canadians across the nation. To be eligible, nominees must be a Canadian citizen or permanent resident, have made significant contribution to a particular province, territory, region or a community in Canada or an achievement abroad that has brought credit to the country – and have been alive Feb. 6, 2012, the 60th anniversary of Queen Elizabeth’s accession to the throne. “It is a significant moment for me to be recognized among this group of honourees. We are all most proud to be Canadian, and it is our responsibility to continue to be advocates and voices that rise above the crowd for the issues and causes we believe in, particularly within our own communities,” shares Lata Pada. Lata Pada was also featured in VisionTV’s series “Spirit of South Asia” in 2010, showcasing the achievements of Canadians of South Asian origin. Dancer-Choreographer, Lata Pada is the Founder and Artistic Director of Canada’s leading South Asian dance company, SAMPRADAYA Dance Creations. She is also the Founder-Director of SAMPRADAYA Dance Academy, a premiere professional dance training organization. Trained under distinguished gurus in India, Kalaimamani K. Kalyanasundaram and Padma Bhushan Kalanidhi Narayanan, Pada has had an extensive career as a bharatanatyam soloist with over 1,000 performances in prestigious dance festivals worldwide. Pada has made Canada her home since 1964; she holds a Masters in Fine Arts from York University. In 2009, Lata was named a member of the Order of Canada; she holds the distinction of being the first South Asian artist to be awarded this prestigious national honour. In 2011, she was conferred the Pravisi Bharatiya Samman Award by the President of India, India’s highest award for overseas Indians. Following the terrorist bombing of Air India 182 in June 1985, in which Lata lost her husband and two daughters, she has been an active spokesperson for the families of the victims. She was a strong advocate for the Inquiry into Canada’s worst act of terrorism and has pushed for changes in legislation regarding aviation security, law enforcement and Canada’s judicial system, which resulted in an official apology from the Prime Minister of Canada in June 2010. Under Lata Pada’s visionary leadership as Founder and Artistic Director, SAMPRADAYA Dance Creations, Canada’s Award-Winning South Asian Dance Company, has established itself as an internationally acclaimed dance company recognized for innovation and excellence in its repertoire. The Company brings a contemporary worldview to award-winning inter-cultural and interdisciplinary creations, a large number of which have been created in collaboration with leading Canadian and international choreographers, composers, designers, playwrights and musicians. In June 2011, the company premiered its biggest project to date, a stunning dance-theatre production titled TAJ, at the Luminato Festival, Toronto. SAMPRADAYA Dance Creations is a Canadian, Mississauga-based professional dance company specializing in the creation and production of classical and contemporary dance works based in the tradition of bharatanatyam, a South Asian dance form. Founded in 1990 by Lata Pada, C.M. 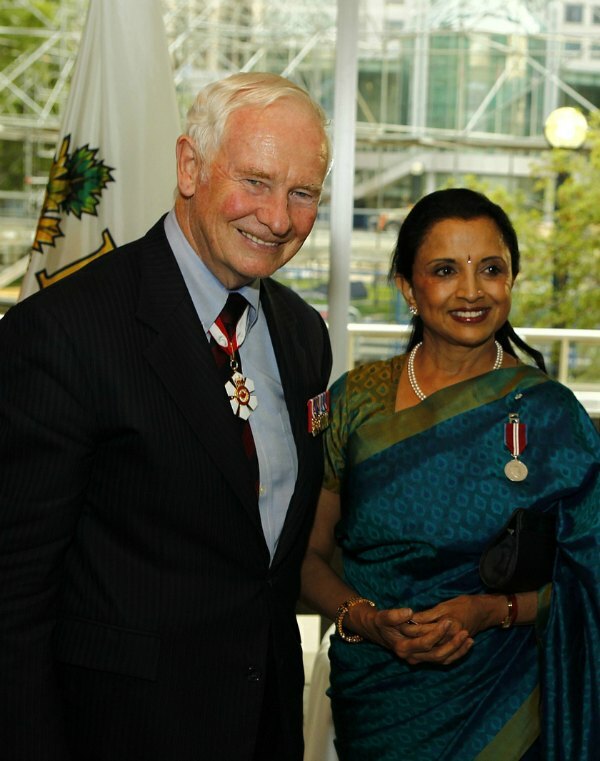 renowned dancer, choreographer and recipient of the Order of Canada, Pravasi Bharatiya Samman and the Queen Elizabeth II Diamond Jubilee Medal, the Company continues to inspire audiences with annual productions produced locally and internationally, while continuing to nurture the talents of emerging young dancers. This entry was posted in Articles, News Releases and tagged articles, Lata Pada, News Releases, Queen Elizabeth II Diamond Jubilee, South Asian. Bookmark the permalink. ← Get Absolutely Fabulous Again!